Gebrselassie willing to jail dopers! Now the head of the Ethiopian Athletics Federation, Gebrselassie is determined to clean up athletics’ image, but has his reasons for why he wants to see Russia return to competition. Starting with a new event fronted by Usain Bolt, this weekend, athletics will spend 2017 attempting to claw back the fans it lost to the doping scandals unearthed last year. But Haile Gebrselassie – one of track and field’s greatest names – feels athletics is missing Russia more than Russia is missing athletics. It’s 8am when The Independent meets Haile Gebrselassie at his basement gym in downtown Addis Ababa, the restless capital city of his native Ethiopia. This represents an early appointment for an interview in sports journalism. However, the double gold-medallist, who set over 20 world records in a glittering distance running career, has already eaten up 15 miles through the hills and forest by the time we meet. Gebrselassie retired from competitive running in 2015, but refuses to slow down. The 43-year-old’s latest high altitude “jog” through Yaya Village, 10 miles north of the metropolis, comes on the second day of a three day religious holiday for the East African country. Most of his compatriots are still in bed. Nursing a serious Achilles injury on a chilly morning, he could have pulled up the duvet too. Instead, he is not just running, but ready to take questions on the role he is playing in cleaning up doping as the newly appointed head of the Ethiopian Athletics Federation. 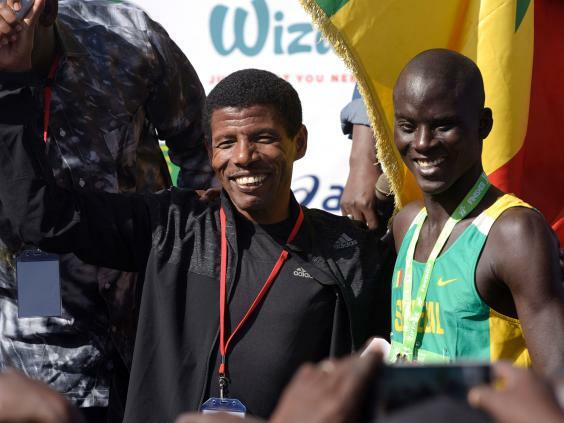 “Next month, Ethiopia will approve the first prison sentence given to a drugs cheat in athletics,” says Gebrselassie, revealing something as yet unreported overseas. Sentences of between three to five years were introduced as deterrents prior to Gebrselassie’s appointment in November but no-one had been brought to court and prosecuted until he took office. The Atlanta and Sydney Olympics 10,000 metres gold medallist and former marathon world record holder is known for his gentle public demeanour. However, the evidence he will give in person at the historic sentencing hearing will showcase the streak of toughness and fairness than runs through him. “We need to be strict,” Gebreselassie says, admitting that Russia was a wake-up call for a sport that had been complacent for too long. Germany is so far the only nation to follow Ethiopia in passing new legislation carrying prison sentences for doping. Gebreselassie has promised life bans from athletics for doping offences also and this is something he hopes can be replicated more swiftly, internationally. “It’s really important to work together, not just the federations, but the event organisers, the athlete managers, everyone. “We need to have honest athletes that forget about shortcuts; ones who believe in sweating, not taking. “When athletes take drugs, they may make money in the short-term, but in the long term, when they think about what they’ve done, they will regret it. “I don’t want to support people who have this evil in them. “I had a long discussion with the federation when I took over and we decided we had no choice but to implement a life-ban policy for athletes caught doping. Girmay Birahun, a little known 22-year-old, will be the first athlete to go to jail for doping. The marathon runner tested positive for Meldonium – the substance that brought down Maria Sharapova – in random out-of-competition testing in the first days of Gebreselassie’s new regime. The drug was added to the World Anti-Doping Agency (Wada) banned list relatively recently but its energy-enhancing capacity is proven. “In a way, I am scared for the athlete, sad for him, for what he will face in jail. Three years minimum. “Some of my athletes are blaming me for the athlete going to prison, but it’s the government who made the decision to give prison sentences and it’s not me testing the urine. “Meldonium is a big drug now, one I am still learning about. Gebrselassie says he was never offered an illegal substance throughout his career. It was the recent scandals in Russia and Kenya which encouraged him and his country’s government to guard against the complacency he admits Ethiopia may have been guilty of in the past. Over 1,000 Russians have been implicated in state-sponsored doping alleged by Wada. Russia continues to be banned from athletics competition while Kenya flirted with a suspension last year. Gebrselassie acknowledges the system has been slack and for too long. Now, it is getting more rigorous. The country’s growing economy is helping to fund greater lab testing in Paris. Combining enhanced testing processes with tougher punishments positions Ethiopia at the forefront of athletics’ belated efforts to be taken seriously. Gebrselassie risks this with his next comments to The Independent however, a contentious call for Russia to be welcomed back into athletics in time for this summer’s world championships in London. It’s a controversial view as Russia’s critics claim it is yet to admit conspiracy let alone countenance meaningful reforms. “There are innocent Russian athletes as well as guilty Russian athletes,” he begins, repeating what many others have been keen to remind the hardliners. Gebrselassie’s second justification is one that no-one in athletics has made during Russia’s suspension. It reflects the deeply competitive traits that still burn within him. He wants the Ethiopian team he now oversees to win the medals the country has struggled to secure since his retirement; but more than that, he wants Ethiopia to win against all the countries he considers to be the historical heavyweights of athletics. “My worry is for the feeling of the competition without Russia. Winning medals in athletics without defeating Russia… you cannot experience the same feeling. Gebrselassie is intent on making competition clean again, but just as he was as an athlete, he wants standards to keep rising and competition to be fierce too. 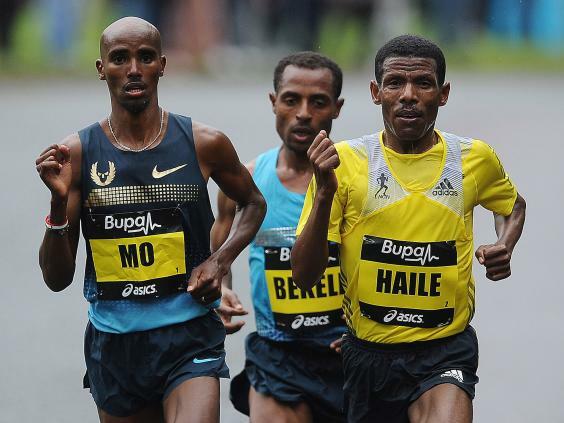 It is not surprising that Mo Farah is hard running with Gebrselassie in Addis throughout the winter. Athletics will lose its two biggest stars when both Farah and Usain Bolt depart the stage, this summer. On and off the track, safeguarding athletics’ future may prove Gebrselassie’s steepest challenge yet.